I have not done enough. I took apart an evil castle built of stone one small block at a time. Much of it remains, and ever will. I did what I could, though. Now, I hope you will as well. Dariel, seeing what I have done, can you forgive me? Do you forgive me? Nâ Gâmen closed his eyes for a time. Opened them. Thank you. Forgiveness is a circle, Dariel. A band that joins us. Thank you. If you will accept it from me, I will give you a blessing. It's the last thing I have to offer you. Will you accept? 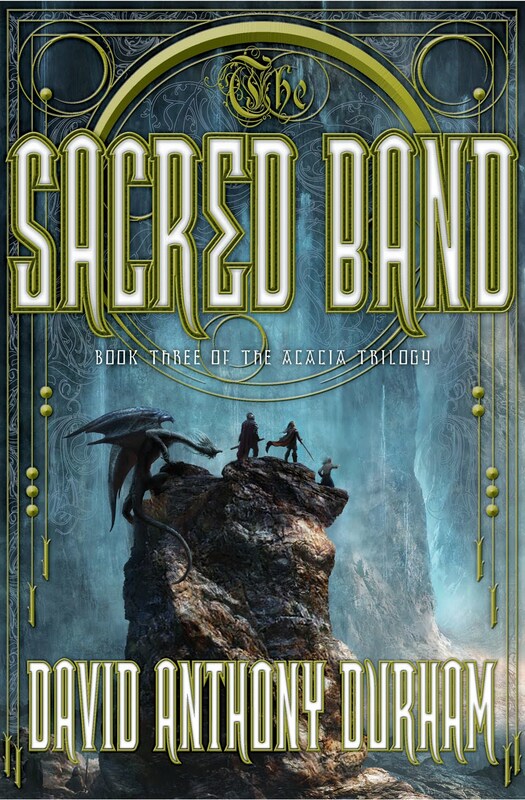 The Sacred Band, David Anthony Durham's final volume in his The Acacia trilogy, not only completes the major plot arcs but also unites thematic elements introduced in Acacia and The Other Lands. In order to review this book properly, some time will need to be devoted toward exploring character motivations, actions, and consequences. Durham set up in those two volumes a complex array of characters, ranging from the separate personalities and goals of the four royal children of the House of Acacia to the northern Mein to the murky history of the southern Santoth sorcerers. While each step of their actions are lucidly drawn out through the first two volumes, there is room to surprise here in The Sacred Band and the final results serve to unite the three volumes into a reflective story that executes several thematic interests in a brilliant fashion. One theme that Durham explores throughout the trilogy is the cool, calculated cruelties that humans can inflict upon one another, especially in that mass suffering known as child slavery (or the Quota in the tale). How easy it is, Durham illustrates through the memories of various characters, to forget the bonds that unite human to human when we reduce our goals and desires to ciphers marked in a dusty account log. We see the callous disregard through the eyes and thoughts of leagueman Sire Dagon, the fear and contempt intermingling through the memories of the Lothan Aklun, the warring ennui and lust for fecund immortality among the Auldek, and the perceived need to maintain a crumbling, exploitative system in order for Queen Corinn. Acacia and The Other Lands introduced readers to these characters and their conflicting desires, setting out a history whose roots were chains around most of its peoples. Throughout The Sacred Band we see these chains bursting. This quote by the eldest of the royal children, Aliver, contains the keystone for this book and for this trilogy. Over the course of the series, we witness several characters develop and change their goals and aspirations. Aliver, the idealist among the four children, realizes here the selfishness that had been imbedded in his goals to reform and reshape Acacian society. Corinn, the ruling queen, has an epiphany of her own after her own callousness is revealed to her. Mena, the fighter, learns to become more than the human end of a weapon. Dariel, the youngest, suffers with the victims of the Quota and his voice becomes the strongest of the four over the course of the trilogy. Others we see at a remove. The League perhaps changes the least of any group or faction; their desire for hidden power and wealth remains mostly constant throughout the series and here in The Sacred Band serves as a counter-example of the moral epiphanies that others experience. The Auldek are much more complex than the superhuman, cool, distant portrayals found in The Other Lands. As the story here progresses, their motivations become more understandable even if the root cause is still deplorable. The Santoth are revealed to be much different than how they appeared in Acacia. At first, their change was puzzling before more information revealed just how subtly Durham had established their characters and motivations in the first volume. With this disparate set of characters, it would have been relatively easy for Durham to have set up a black/white, good/evil dichotomy and let the two forces battle it out. He does not do this. Although there is some fighting and although there is some suffering and loss of life through external conflict, the main struggle is internalized and reveals itself in little passages such as the quote involving Dariel and a mystic who haunts the remains of an ancient castle. How does one combat indifference and casual cruelty? For some, the answer likes in the creation of new, voluntary bonds that shatter the old chains, forming "sacred bands" that are stronger because people give freely of their own volition rather than having their lives and souls taken from them. For others, it is the admission that they do not and cannot run the show and that advancement is made by submission to this rather than fighting against the realization that one cannot reform others if s/he cannot accept self-reformation. Durham rarely rings a false note during the course of The Sacred Band. Characters that might have seemed oddly cold and distant in the first volume have by the end of the third gained a depth of character and voice that is rarely found in epic fantasies and is not that common in other, more character-oriented literary genres. The final pages bring full circle the promise of the earlier volumes, making The Sacred Band one of the most satisfying and fulfilling epic fantasy conclusions that I have read in recent years. 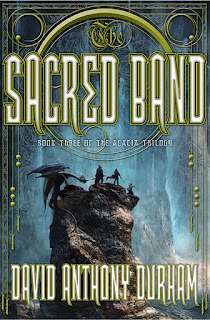 The Sacred Band is easily one of the best 2011 epic fantasy releases and it is one that I highly recommend to readers here.